Corn recovered 20 cents in a week while soybeans are up 40 cents in two weeks. Funds have been short covering as both soybeans and corn have been receiving good export demand. China is buying soybeans from Arg/Brazil and they are in turn buying replacement beans from the US! Mexico booked over 650K tonnes of beans from the US this morning, which is about 24mm bushels. Below we have the Supply and Demand tables I talked about on the podcast. At 93mm acres and a 178 yield, carryout is not so bad when using 2.4mm exports. Using these assumptions it is hard to get bearish on corn below this year’s lows. Soybeans are a different story. We need to shed 500mm bushels from the balance sheet to get back down the around 400mm. 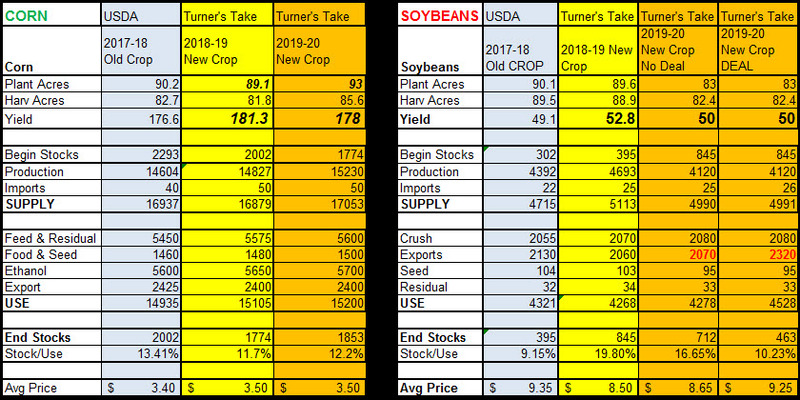 The table below shows two columns for 2019-20 soybeans. The first shows 83mm acres, a 50 trend line bpa yield, and NO US/China trade deal. The next column shows 83mm acres, a 50 trend line yield, and a trade deal that adds back 250mm back to export demand. Scenario #2 gets soybeans to the $9s and $10s. If you are having trouble listening to the podcast, then please click here for Turner’s Take Podcast episodes! Turner’s Take Ag Marketing – includes access to premium web content. Turner’s Take Ag Marketing – includes an email newsletter subscription. Turner’s Take Ag Marketing – trial lasts 30 days.